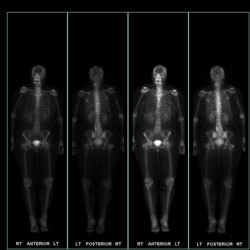 Nuclear medicine is a special method of examination that uses small amounts of radioactive materials called radiopharmaceuticals, to create images of bone, tissue, and organs. It is unique because it reveals both form and function of a targeted area, while other methods only reveal anatomical images. The radioactive materials are administered by mouth, injection, or inhalation, and are attracted to specific internal structures. Data is gathered from pictures that measure levels of radiation emitted from the targeted structure. This information is then conveyed onto film or computer for interpretation. Common uses of nuclear medicine include tests of the thyroid, brain, bones, lungs, heart, liver, and gallbladder.